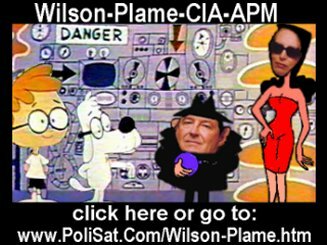 WEBCommentary(tm) - Armitage and Plame drive final nails into own political coffins as collaborators in Fitzpatrick's political show-trial of Scooter Libby. Armitage and Plame drive final nails into own political coffins as collaborators in Fitzpatrick's political show-trial of Scooter Libby. Fitzgerald's appointment was for the purpose of discovering, and prosecuting if warranted, whoever "leaked" to the press the status of Valerie Plame as a CIA employee who promoted her anti-Bush husband, Joe Wilson, for a "mission" to Niger to investigate intelligence reports that Saddam Hussein had attempted to acquire "yellowcake" uranium. The witch-hunt nature of such prosecution became undeniably clear when, in the latter stages of Fitzgerald's relentless pursuit of Vice President Cheney's Chief of Staff, "Scooter" Libby, it became public (no thanks to Fitzgerald) that almost immediately after he was appointed, he learned the "leaker" who disclosed such information to columnist Robert Novak, a staunch critic of Bush's decision to topple Saddam, was none other than Colin Powell's deputy, Richard Armitage, who also was a staunch inside-the-Bush-Administration critic of Bush's decision to topple Hussein. Thus, Fitzgerald knew almost at the beginning that the "leaker" was an opponent of Bush within his administration; that the recipient of the leak was a commentor likewise opposed to toppling Saddam; and that the subjects of the leak–- Valerie Plame and Joe Wilson —- were likewise staunch opponents of such policy. Thus, the "leaker" was politically simpatico with the subjects of the leak rather than a Bush administration official opposed to their views. Consequently, Fitzgerald knew from the start that the allegations (by Plame, Wilson and other critics of Bush) that "leak" was by a Bush Administration official acting with intent to "retaliate" against Plame and Wilson were false and that the "leaker" was instead an inside critic of Bush who was politically sympathetic with Wilson's and Plame's (and Novak's) harsh criticisms of Bush's decision to topple Saddam. It's difficult to imagine what else would be necessary make it self-evident that Fitzgerald's subsequent continuation of his "investigation" and his relentless pursuit and prosecution of Libby constituted anything less than a political witch-hunt of the kind we came to expect in the China and the Soviet Union-- especially in light of Fitzgerald's having instructed Armitage from the "getgo" to keep his mouth shut about his having identified himself as the "leaker." Furthermore, As Bryan Preston aptly noted, Valerie Plame describe the action by Armitage (whom she knew to be an opponent of Bush within his administration) in "leaking" her name to Robert Novak as "foolish" but had consistently described the alleged "leak" by Scooter Libby as "criminal" conduct equivalent to treason. For questions that Fitzgerald should be required to answer to a bar association (as was Nifong), see my "Open Letter to Patrick Fitzgerald re 'Scooter' Libby, Joseph Wilson, Valerie Plame, Richard Armitage, Karl Rove, Robert Novak, et al.". To critics of my commentary about Fitzgerald who would point out that a "jury" convicted Libby, I borrow an analogy from football to say a prosecutor who obtained a conviction of a an official of the Bush administration by a jury in one of the hottest of anti-Bush hotbeds in the country (Washington, D.C.) is not entitled to do an "end-zone dance." Indeed, I think Libby has an excellent chance for a reversal of his conviction on appeal-- especially in light of two things: (1) abundant evidence that other witnesses gave "false" testimony that was justifiably attributed to the frailty of human recollection rather than perjurious intent and (2) that the court excluded scientific evidence proffered by Libby to support his assertion that "false" testimony he gave was likewise the product of such human error. At the very least, such proffered scientific evidence had substantial probative value with respect to Libby's assertions of innocence-- especially under the "reasonable doubt" burden of proof in criminal cases. –Jim Wrenn, Editor at PoliSat.Com. A permanent link to this November 13, 2007 commentary is: http://PoliSat.Com/Wilson-Plame.htm#20071113-01.